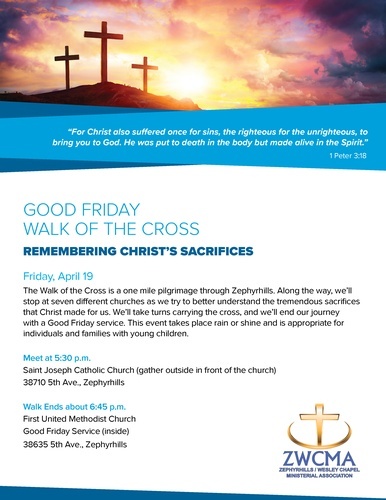 The Walk of the Cross is a mile pilgrimage through Zephyrhills. Along the way, we'll stop at seven different churches as we try to better understand the tremendous sacrifices that Christ made for us. We'll take turns carrying the cross, and we'll end our journey with a Good Friday service. This event takes place rain or shine and is appropriate for individuals and families with young children.